Independent freeware games can hardly be mentioned without adding Cave Story to the discussion, a Metroidvania-style title that was originally developed solely by Daisuke "Pixel" Amaya over the span of five years. Whether it was the game's classic side-scrolling action, its endearing characters, or the surprisingly emotional storyline, Cave Story found a place in thousands of gamers' hearts long before it was ever considered for retail release. Cave Story was originally available for free on the PC, but has now come to WiiWare thanks to developer Nicalis with a host of upgrades and new modes. Cave Story is an action-based platformer. If Braid's main character was Mario with a suit, Cave Story's Quote is Mario with a gun. Or, it would be more accurate to say an assortment of guns, as Quote picks up multiple weapons with different capabilities. Quote will start off with a typical energy blaster, but later is able to find a missile launcher and other weapons that are more exotic. Quote's armaments can be upgraded up to four times by collecting experience power-ups dropped from enemies, which will sometimes completely change the way these weapons work in addition to increasing their strengths. However, getting hit will reduce their experience levels back down again. Much like Metroid, Quote's health and missile capacities can also be upgraded by collecting capsules hidden throughout the game world. And upgrade Quote must, as he'll be facing enemies and bosses of many varieties. 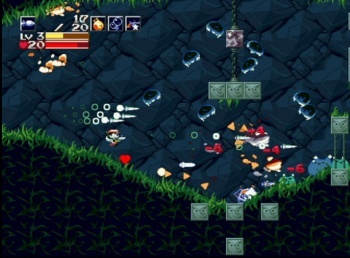 Cave Story first puts players up against creatures such as docile anime elephants and pesky flying insects, but later has them encountering giant, enraged bunnies and a plethora of great boss battles. The creativity in the boss design is one of the game's most enjoyable aspects. Every boss is unique and often requires a different strategy to defeat other than just mashing the fire button and jumping. In addition to the interesting creature design, the game's story and characters are very endearing and likable. Told mostly through dialog, Cave Story's narrative gives you the feeling that the world has been around for a while and doesn't exist solely for Quote to run around in and blast stuff. The progressive discovery of the game's story threads is part of the experience, but basically they involve a floating island that an evil doctor is trying to manipulate for his own ends. Nothing too mind-blowing here, but I guarantee you will feel a sense of emotion when the game's characters are unthinkably killed or make sacrifices for one another, just as if Luigi hopped in front of a shell to save Mario and died. Cave Story's music emphasizes the game's emotional feel, and Amaya's original soundtrack is one of the best out there for chiptune fans. Remixed music has been added to the WiiWare release, but Nicalis has provided the ability to play through the game with either version. Unless you really can't stand chiptunes, I would recommend using the old soundtrack first, because the new soundtrack is decent but doesn't quite have the soul of the original. The game's graphics have also been upgraded and they look great, though players might want to still check out the original graphics just to get an idea of how the game was originally released. Quote's adventure is not incredibly challenging, but it does use a save point system that may send players back a ways at times. The only time this is anywhere near frustrating, due to the inclusion of many save points, is before the final boss battle, a gauntlet that most people will have to attempt multiple times. Up to that point, the game's design is definitely not on the level of anything like LittleBigPlanet, but is fun and light and remains engaging throughout each of the new areas discovered. There are some mini-puzzles to complete in certain areas, but Cave Story is mostly about blasting your way through enemies and helping the world's denizens. Once beaten, the game can be played in hard mode, which truly is an iron-gamer's challenge as it gets rid of all health-increasing capsules. Cave Story's original release gave players multiple reasons to play the game at least a second time, and the WiiWare version only adds more: a Boss Rush mode, Sanctuary Attack mode, and the ability to play as a different main character named Curly Brace which changes the story a little. Cave Story's secrets provide even more replay value, as the game has multiple endings, secret weapons, a hidden area that is the hardest in the game, and a secret way to save one of the game's characters that normally dies. Bottom Line: Cave Story is fairly short, but provides a unique, somewhat emotional, action-based experience totally worth $12. Recommendation: If you don't mind the cutesy presentation, Cave Story is for any action-platformer fan, and a must buy for the indie inclined. For those that have already played the PC version, upgrades and new modes make it worth spending money on this time. Tom Goldman also shoots missiles at elephants in real life.